Are you afraid of heights? Then you might want to stay away from a certain new aerial lift! The Genie SX-180 telescopic boom, the world’s tallest aerial lift, can reach 180 feet above the ground. Equipment World had an online article that showed a reporter on the lift. The Genie SX-180 can go 30 feet higher than the last “world’s tallest” boom, according to the report. 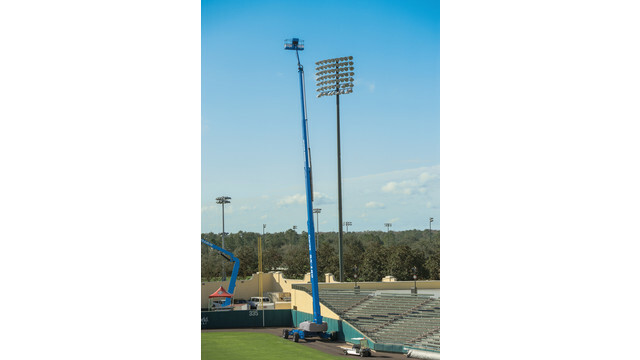 And while that may not seem like much when you’re talking about hundreds of feet up, that distance is very important because it can access larger equipment. The Genie SX-180 is a great choice for construction companies, oil & gas firms, large-scale builders and many others. Plus, the 180-foot distance can be reached in about 5 minutes – not quite the speed of your favorite rollercoaster (and that’s probably a good thing! ), but not too slow, either. So how much will you expect to pay if you want to rent the Genie SX-180 for a week? Somewhere between $10,000 and $15,000. That price is much cheaper than similar aerial lifts and truck-mounted booms. Genie thinks the SX-180 will be a popular choice as more and more companies use it. At 180 feet above the ground, safety is a concern. If you’re thinking about becoming an aerial lift operator or working on a lift like the SX-180, it is very important to receive good training. CertifyMeOnline.net is a great place to get certified on aerial lifts and booms like the Genie SX-180. You can get updated or new certification with our company. Our prices and quick online testing are a few reasons why CertifyMeOnline.net is so popular. Along with aerial lift training we also have excellent scissor lift certification, fall protection courses and much more. Please give us a call at (602) 277-0615 to get started. You can also check out our contact page to send an email message. Aerial lift certification makes a smart first step in your new career. Thanks for visiting our website and reading our blog. If you have any questions or comments, please don’t hesitate to contact us. This entry was posted in Aerial Lift Training on February 5, 2014 by admin.